Sometimes the little subtle, hard-to-find updates make a difference. While the Google Drive folder embed is still relatively new, I have seen it widely used in internal sharing sites. That popularity has tipped the Google Sites team to make this feature even more worthwhile. There are now 2 views available for the Google Drive Folder embed 1) List View 2) Grid View. By way of review, remember that the Google Folder feature is in Edit Page Mode > Insert > Folder. The List View is what we are used to. However, even it has changed a bit. Please see the following two screenshots to get an idea of what I mean. The List View used to be more compact and only had room for a description. The New List View is more spacious and shows the When and Who last modified the Doc. List or Grid View, which will you choose? Grid view, seen just above, is a more direct way of viewing what is actually inside of document. It provides a little thumbnail view of the document, which leads to better quick selections. Drawings and Presentations also have thumbnails, while spreadsheets do not. It is very similar to the Google Drive folder view. Why the change you may ask. Well, as I mentioned at the outset, File Sharing is becoming a hallmark of Google Sites, especially in the Intranet / Sharepoint Breaking model. Google is inching its way to becoming a real competitor in the way of usability. The interaction of Google Apps is the hugest selling point for Google Sites and it is becoming more of a viable argument with each update. Now we just need an "Add Search Box" option and we are good to go! We love being creative and we love sharing the good news about our templates. If you are in the market for a Google Sites template that appeals to flat design and is perfect for the discerning intranet admin, please check it out. 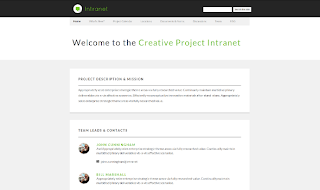 New Flat Intranet Template available here.